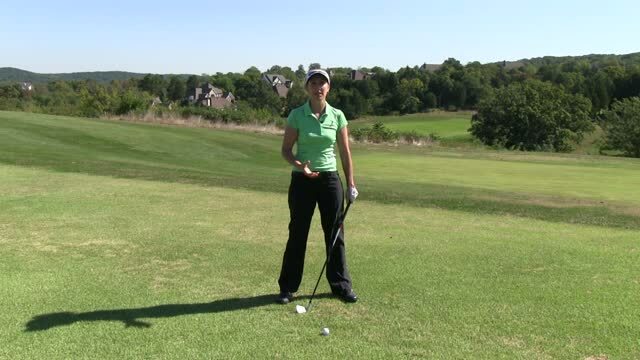 Description: The Wide to Narrow Drill is one of my personal favorites for creating lag in the downswing. Good golf swings create a nice wide arc on the backswing and then a more narrow arc on the downswing. As deeper angles are created upon transition, power is increased. One of the most common swing flaws in the game is casting or releasing early which results in not only a huge loss of power, but also loss of control over the clubhead if it passes the player's hands. This drill is a fantastic fix for this oh so common problem. Set up without a ball to make some practice swings. When swinging back feel like you are making a huge wide arc with your club head and arms extending away from your body. As you transition into the downswing feel the angles in your wrists and rear elbow decrease or get deeper (i.e. go from 120 degrees with your rear elbow to 85 degrees). While you are making practice swings look at the clubshaft and as you are swinging down try to get it to move closer in to your right shoulder. Hogan was famous for this move. When this happens you are increasing your clubhead lag tremendously. The longer you can keep the clubhead behind your hands in the downswing, the more speed you will generate. Finally, try to do it with a ball. This should give you the feeling of the club trailing your hands and body and building momentum in the downswing. If you have been casting or releasing early it will give you the feeling of a very late hit. Don't fret if the ball shoots off to the right (for right handed player) as that may be a sign you are actually lagging the club, but just haven't timed it correctly with your rotation.